This is a 1998 book by the long-time conservative and well-known author of The Book of Virtues. 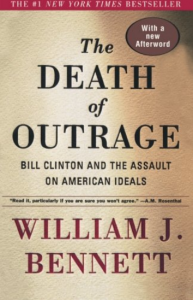 The sub-title is “Bill Clinton and the Assault on American Ideals.” This book was released just before President Clinton gave his public deposition before the Federal Grand Jury. Bennett’s purpose in the book is to defend traditional ideals and morals during the present Washington scandals.